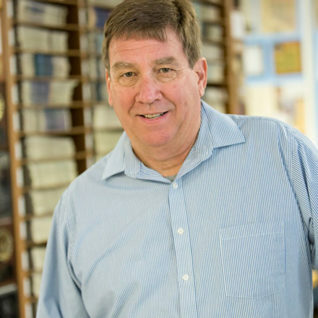 DeBolt has been with Contra Costa College since beginning his career as a full-time professor here in 1980, at the age of 25. He has chaired the department, taught journalism and advised the student newspaper, The Advocate, ever since. His impressive history of awards and honors includes the California Newspaper Publishers Association statewide Teacher of the Year award in 1992; the Contra Costa Community College District Teacher of the Year award for 2007-08; the College Media Advisers Noel Ross Strader and Distinguished Two-Year Newspaper Adviser Awards in 1998 and 2010, respectively; recognition by the Bay Area Society of Professional Journalists for Distinguished Service in 1997; and the California Journalism Educators Coalition’s Lifetime Service Award in 2011. He was also honored as CCC’s Distinguished Alumnus in 2016. In 1975, DeBolt met his wife Joan right here at CCC, where he played on the men’s basketball team and served as editor-in-chief of The Advocate. They married in 1978 and have four grown children. He had grown up in the area, attending Collins, Ellerhorst, Sheldon and Valley View elementary schools before moving on to Juan Crespi Middle School and De Anza High School, which he graduated from in 1972. After graduating from CCC, he went on to earn his bachelor’s and master’s degrees at San Diego State University. He is a regular contributor and workshop host at regional, state and national journalism conventions, and has served as president, executive secretary and NorCal president of the Journalism Association of Community Colleges. DeBolt coached CCC’s women’s basketball team for 30 consecutive seasons (1986-2016,) guiding the Comets to 11 Bay Valley Conference Championships, 19 playoff berths and two State Championship Games. During that time, he served tenures as treasurer and historian of the California Community College Women’s Basketball Coaches Association. In his free time, he enjoys golf, yard work, reading and caring for his family’s three dogs, Roxy, Bella and Comet.